While Americans hold disparate views on how the U.S. should pursue its military and foreign policy, these issues generally do not represent the deepest divides across typology groups. This stands in contrast to the findings of the previous political typology study in 2005, in which national security issues were among the most divisive – a shift that reflects the public’s increasing focus on domestic policy over foreign policy. Democratic groups continue to be more internationalist and more focused on diplomacy over the use of force than their Republican counterparts, but the gaps are far narrower than previously. There remain deep ideological divisions, however, over China, Islam and the United Nations. Reflecting their focus on domestic economic issues, 58% of the public says we should pay less attention to problems overseas and concentrate on problems here at home, 33% say it is best for the future of our country to be active in world affairs. 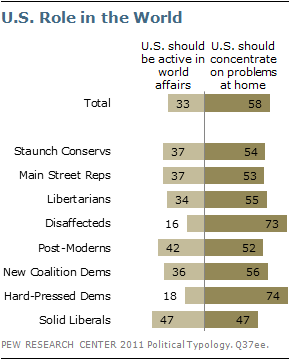 Six years ago, 49% said we should concentrate on problems at home, while 44% supported being active in world affairs. The broadest support for international engagement comes from Solid Liberals and, to a slightly lesser extent, Post-Moderns, both of whom are divided over whether it is better for the U.S. to be active in world affairs or to concentrate on problems here at home. In all other groups, clear majorities say dealing with domestic problems should come first. This inward-looking sentiment is highest among Hard-Pressed Democrats and Disaffecteds; nearly three-quarters of both say the U.S. should concentrate on problems at home. This is consistent with previous typology studies in which the most economically stressed groups prioritize a focus on dealing with domestic problems. Majorities in both of the predominantly Republican groups – the Staunch Conservatives and Main Street Republicans – favor focusing on problems at home over being active in the world (by 54%-37% and 53%-37%, respectively). By contrast, foreign engagement was deeply divisive on the right six years ago. In the 2005 typology study fully 73% of the politically conservative Enterprisers said it was best for the future of our country to be active in world affairs – the most among any of the 2005 typology groups and far more than among other GOP groups. This is a sentiment no Republican, or even Republican-leaning, groups express today. A majority of the public (53%) says the U.S. should take into account the interests of its allies, even if it means making compromises with them; 36% say the U.S. should follow its own national interests even when its allies strongly disagree. As in the past, Solid Liberals stand out for their support for multilateralism – 72% say we should take into account the interests of our allies in setting foreign policy. Majorities of New Coalition Democrats (61%) and Democratic-leaning Post-Moderns (60%) agree. However, views across the Democratic coalition are not uniform as Hard-Pressed Democrats are divided in their views: 44% say the U.S. should follow its own interests, 39% say it should consider its allies. There is no group in which a majority favors a unilateralist approach to foreign policy. Even among the Staunch Conservatives – who tend to favor a more assertive military stance in general – 47% say we should follow our own interests even when allies strongly disagree, while 40% say we should make compromises with allies to account for their interests. 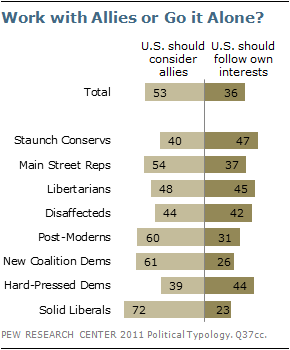 And a 54% majority of Main Street Republicans also say allied interests should be addressed. As with views of foreign engagement, this represents a substantial change on the right since the previous typology in 2005. Six years ago, nearly three-quarters (73%) of Enterprisers, one of the most conservative typology groups, favored the U.S. going its own way even when allies disagreed. In the Middle East, the public views regional stability as more important than the spread of democracy. A 52% majority says it is more important to have stable governments in the Middle East, even if there is less democracy in the region; 37% say it is more important to have democratic governments, even if there is less stability. There is consistent agreement among the Republican and independent typology groups that regional stability is most important: between 55% and 61% of each of these typology groups prioritize stable governments in the Middle East over democratic governments; this includes 61% of the Democratic-leaning Post-Moderns. 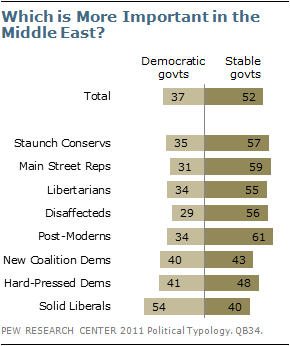 Only among Solid Liberals does a slim majority (54%) say democratic governments are more important even if there is less stability in the Middle East. New Coalition and Hard-Pressed Democrats express mixed views, with about as many prioritizing democratic governments as stable governments. On balance, the public says it was the right decision (45%) for the U.S. and its allies to conduct military air strikes in Libya, 37% call it the wrong decision. Slim majorities in three Democratic and Democratic-leaning groups, the Solid Liberals (58%), the New Coalition Democrats (55%) and the Post-Moderns (53%), say taking action in Libya was the right decision. But views are mixed in the other five groups, including the Hard-Pressed Democrats (40% right, 32% wrong); a relatively large share of the Hard-Pressed (28%) offer no opinion. Half the public (50%) says Barack Obama is handling the pace of U.S. troop withdrawals from Afghanistan about right, 30% think he will not remove troops quickly enough and just 12% say he will remove troops too quickly. Staunch Conservatives fault Obama for drawing down U.S. forces from Afghanistan too quickly. About half (52%) of Staunch Conservative say they think Obama will remove troops too quickly – far more than any other typology group. But many GOP-oriented Disaffecteds express the opposite concern: 44% say Obama is not removing U.S. troops from Afghanistan quickly enough, which is the highest among typology groups. 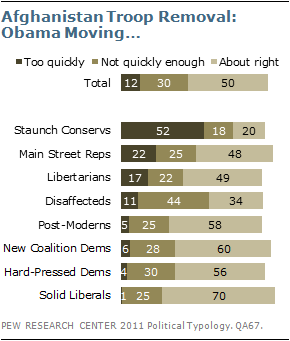 Majorities of Democratic and Democratic-leaning groups say Obama is handling the situation about right; pluralities of Libertarians (49%) and Main Street Republicans (48%) agree. By a 53%-40% margin, the public views building a stronger relationship with China on economic issues as more important than getting tougher with China on economic issues. Staunch Conservatives stand out from all other typology groups on this question and overwhelmingly favor getting tougher with China on economic issues: 79% say this, just 16% echo the broader public and prioritize building a stronger relationship with China. Among all other typology groups, opinion is mixed or supportive of building a better relationship with China. 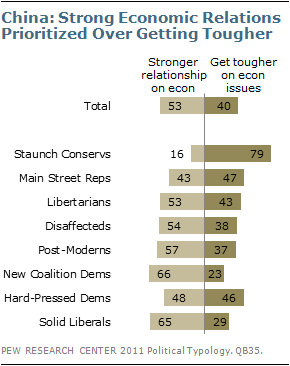 About as many Main Street Republicans say it is more important to build a stronger relationship with China (43%) as support getter tougher on economic issues (47%). Among independent groups, Libertarians are divided, with 53% favoring a stronger relationship with China and 43% wanting to get tougher. The balance of opinion among Disaffecteds and Post-Moderns favors building a stronger economic relationship with China (by 54%-38% and 57%-37%, respectively). Among Democratic groups, about two-thirds of Solid Liberals (65%) and New Coalition Democrats (66%) say that building a stronger economic relationship with China is more important than getting tougher on economic issues. Hard-Pressed Democrats are divided: 48% say build a stronger economic relationship with China, 46% say get tougher on economic issues. By 48% to 41%, more say free trade agreements between the U.S. and other countries are a good thing for the country than say they are a bad thing. Disaffecteds are the only group where a majority (57%) says free trade agreements are bad for the United States. Both Republican groups and Libertarians are divided in their views. Majorities of Post-Moderns (54%), New Coalition Democrats (59%), and Solid Liberals (52%) say free trade agreements are a good thing for the country. Fewer Hard-Pressed Democrats (40%) express this view. The United Nations is viewed unfavorably by an overwhelming 72% of Staunch Conservatives – an opinion that places Staunch Conservatives 20 points away from the next most negative group. Libertarians also hold a negative view of the United Nations, but by a more modest 52%-26% margin. Main Street Republicans (37% unfavorable, 47% favorable) and Republican-leaning Disaffecteds (33% unfavorable, 42% favorable) offer much more tempered reactions to the U.N. Solid Liberals are about as favorable toward the U.N. as Staunch Conservatives are unfavorable: 75% hold a favorable view, just 17% an unfavorable one. However, there is far more consensus among the broader Democratic coalition than there is among the broader Republican coalition. Solid Liberals are joined by majorities of New Coalition Democrats (69%), Post-Moderns (60%), and Hard-Pressed Democrats (54%) in expressing favorable views of the United Nations. When it comes to the relationship between Islam and violence, as many say the Islamic religion is more likely than others to encourage violence among its believers (40%) as say it does not encourage violence more than other religions (42%). Staunch Conservatives and Solid Liberals, however, take overwhelmingly one-sided – and opposing – views on the issue: fully 84% of Staunch Conservatives say the Islamic religion is more likely than other religions to encourage violence among its believers. Solid Liberals are almost as uniform in rejecting this idea (71%). Opinion is less one-sided among other typology groups. Among the broader GOP coalition, majorities of Main Street Republicans (58%) and Libertarians (52%) say Islam is more likely than other religions to encourage violence; Disaffecteds are split (39% say Islam does encourage violence more, 35% say it does not). 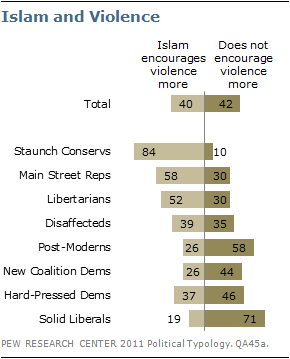 Among Democratic groups, most Post-Moderns (58%) say Islam does not encourage violence more than other religions. On balance, New Coalition Democrats also say that Islam is not more likely to encourage violence (by 44% to 26%), but Hard-Pressed Democrats are divided (46% say Islam does not encourage violence more, 37% say it does). Nearly seven-in-ten (68%) say that Americans should not have to give up privacy and freedom in order to be safe from terrorism; about a quarter (26%) say Americans need to be willing to give up privacy and freedom in order to be safe from terrorism. This is a rare question in which there is broad consensus across typology groups. In fact, at least 60% of all groups agree that Americans should not have to give up privacy and freedom in order to be safe from terrorism. Hard-Pressed Democrats (78%-17%) take this position by the widest margin, but there is little variance among other groups: Democratic, Republican and independent alike.